For the legal theory of self-defense, see Right of self-defense. For other uses, see Self Defense (disambiguation). "Home defense" redirects here. For the film, see Home Defense. Self-defense (self-defence in some varieties of English) is a countermeasure that involves defending the health and well-being of oneself from harm. The use of the right of self-defense as a legal justification for the use of force in times of danger is available in many jurisdictions. Many styles of martial arts are practiced for self-defense or include self-defense techniques. 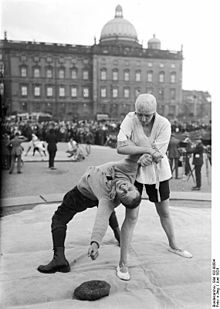 Some styles train primarily for self-defense, while other martial or combat sports can be effectively applied for self-defense. Some martial arts train how to escape from a knife or gun situation, or how to break away from a punch, while others train how to attack. To provide more practical self-defense, many modern martial arts schools now use a combination of martial arts styles and techniques, and will often customize self-defense training to suit individual participants. In many cases there are also legal restrictions. While in some jurisdictions firearms may be carried openly or concealed expressly for this purpose, many jurisdictions have tight restrictions on who can own firearms, and what types they can own. Knives, especially those categorized as switchblades may also be controlled, as may batons, pepper spray and personal stun guns and Tasers - although some may be legal to carry with a license or for certain professions. Being aware of and avoiding potentially dangerous situations is one useful technique of self-defense. Attackers will typically select victims they feel they have an advantage against, such as greater physical size, numerical superiority or sobriety versus intoxication. Additionally, any ambush situation inherently puts the defender at a large initiative disadvantage. These factors make fighting to defeat an attacker unlikely to succeed. When avoidance is impossible, one often has a better chance at fighting to escape, such methods have been referred to as 'break away' techniques. Understanding the 'mindset' of a potential attacker is essential if we are to avoid or escape a potentially life-threatening situation. Verbal Self Defense, also known as Verbal Judo or Verbal Aikido, is defined as using one's words to prevent, de-escalate, or end an attempted assault. This kind of 'conflict management' is the use of voice, tone, and body language to calm a potentially violent situation before violence actually ensues. This often involves techniques such as deflecting the conversation to individuals who are less passionately involved, or simply entering into a protected empathetic position to understand the attacker better. Lowering an attacker's defense and raising their ego is one way to de-escalate a potentially violent situation. Jujutsu and arts derived from it, such as Aikijujutsu, Aikido, Bartitsu, German ju-jutsu, Kodokan Goshin Jutsu. Traditional unarmed fighting styles like Karate, Taekwondo, Kung fu, Hapkido, Pencak Silat, etc. These styles can also include competing. Traditional armed fighting styles like Kali Eskrima and Arnis. These include competing, as well as armed and unarmed combat. Martial sports, such as boxing, kickboxing, Muay Thai, savate, shoot boxing, Sanshou, grappling, judo, Brazilian jiu-jitsu, Sambo, mixed martial arts, and wrestling. 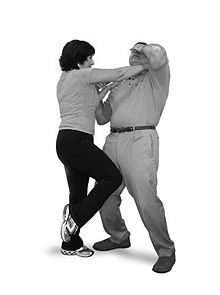 A course in self defense will typically comprise three parts, namely the knowledge of how to fight (which all of the above will cover to some degree), avoidance and de-escalation techniques, and knowledge of the law regarding self defense in the jurisdiction in question. Similar clauses are found in the legislation throughout the western world. They derive historically from article 6 of the French Penal Code of 1791, which ruled that "manslaughter is legitimate if it is indispensably dictated by the present necessity of legitimate defense of oneself or others". The modern French penal code further specifies that excessive self-defense is punishable due to "disproportion between the means of defense used and the gravity of the attack" defended against. The British Law Commission Report on Partial Defenses to Murder (2004) Part 4 (pp78/86) recommends a redefinition of provocation to cover situations where a person acts lethally out of fear. The present view of psychiatrists is that most people act in violent situations with a combination of fear and anger and that separating these two types of affect is not legally constructive. In practice, however, self-defense laws still do make this distinction. German criminal law (§ 33) distinguishes "asthenic affect" (fear) from "sthenic affect" (anger). Excessive self-defense out of asthenic affect is not punishable. In any given case, it can be difficult to evaluate whether force was excessive. Allowances for great force may be hard to reconcile with human rights. The Intermediate People's Court of Foshan, People's Republic of China in a 2009 case ruled the killing of a robber during his escape attempt to be justifiable self-defense because "the robbery was still in progress" at this time. In the United States between 2008 and 2012, approximately 1 out of every 38 gun-related deaths (which includes murders, suicides, and accidental deaths) was a justifiable killing, according to the Violence Policy Center. ^ Branded a criminal - Red Offender spray is rolled out at Canterbury's nightspots (KentOnLine.co.uk, 13 May 2010). Retrieved on 2012-08-05. ^ Concealed Carry Handguns-Advancecompoundbow.com (2018-09-11). Retrieved on 2019-01-10. ^ Stickgrappler. "SELF-DEFENSE: Lee Aldridge - Handling "Stranger" Confrontations: A 12Step Plan to Success ~ Stickgrappler's Sojourn of Septillion Steps". ^ Mattingly, Katy (July 2007). Self-defense: steps to survival By Katy Mattingly. ISBN 978-0-7360-6689-1. Retrieved 28 July 2010. ^ Child Safety Alarms at LoveToKnow Safety. Safety.lovetoknow.com. Retrieved on 2012-06-02. ^ L'homicide est commis légitimement, lorsqu'il est indispensablement commandé par la nécessité actuelle de la légitime défense de soi-même et d'autrui. ^ disproportion entre les moyens de défense employés et la gravité de l'atteinte, Article 122-5. ^ Are There Limits to Self-Defense? Beijing Review, 28 April 2009. ^ Martelle, Scott (19 June 2015). "Gun and self-defense statistics that might surprise you -- and the NRA". Los Angeles Times. Retrieved 16 February 2018. Look up self-defense in Wiktionary, the free dictionary. This page was last edited on 24 April 2019, at 09:02 (UTC).